Ian McKellen has earned more than sixty major international acting awards including a Tony Award for Amadeus, four Olivier Awards (for Pillars of the Community, Bent, Wild Honey, and Richard III), the Screen Actors Guild Award for Fellowship of The Ring, a Cable ACE Award for And the Band Played On... , and a Golden Globe Award for Rasputin. His portrayal of James Whale in Bill Condon's film Gods and Monsters received honours from around the world, including nominations for the Academy Award (Oscar), Screen Actors Guild Award, the Golden Satellite, and the Golden Globe. In 1999 he was named "Best Actor" by the National Board of Review, Los Angeles Film Critics Association, Chicago Film Critics Association, Toronto Film Critics, Broadcast Film Critics Association, the Independent Spirit Awards, the Online Film Critics Society, the British Independent Film Awards, and many others. His portrayal of the wizard Gandalf the Grey in Peter Jackson's film The Lord of the Rings: The Fellowship of the Ring received accolades from critics and filmgoers worldwide, including his second nomination for the Academy Award. In 2007, McKellen was nominated for an Emmy for Outstanding Guest Actor in a Comedy Series for his appearance on EXTRAS! In 2009, he received another Emmy nomination for the television version of King Lear. McKellen's performances in King Lear and as Chekov's The Wood Demon at the Brooklyn Academy of Music in 1974 brought him a Drama Desk Award. McKellen was honored with an Olivier Award for his performance as Max in the world premiere of Martin Sherman's riveting and ground-breaking play Bent. He then won the Tony, Drama Desk, New York Drama League, and Outer Critics Circle Awards for his portrayal of Salieri in the Broadway production of Peter Shaffer's Amadeus. In 1982 he was voted The Royal Television Society's Performer of the Year for his portrayal of the mentally-handicapped hero of Stephen Frears' Walter, the film that launched Britain's Channel 4. He won his third Drama Desk Award when he took his one-man show, Acting Shakespeare, to New York in 1983. After winning the London Critics' Award and the London Evening Standard Award for Iago in Trevor Nunn's Othello at the Royal Shakespeare Company in 1989, he produced and starred in the Royal National Theatre's world tour of Richard III, which had its 300th performance in Los Angeles, and won the SWET Award. In 1991, McKellen was knighted by the Queen for his services to the performing arts, and he succeeded Stephen Sondheim as Professor of Contemporary Theatre at Oxford University. McKellen has been nominated four times for the Emmy (Rasputin, And the Band Played On, EXTRAS!, and King Lear), and three times for the BAFTA (Richard III, Fellowship of The Ring, Return of The King). 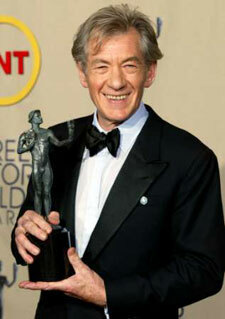 In 2003, Variety named McKellen "UK Personality of the Year." In 2006 he was awarded the Golden Bear at the Berlinale, and a Special Award from the Society of London Theatre for his achievements. Iin 2007, Queen Elizabeth II named McKellen a Companion of Honour for his “outstanding achievements as an actor and also for his work in championing the causes of diversity”. In 2009 he was given lifetime achievement awards at San Sebastian Film Festival and the Evening Standard Awards. In 2014 McKellen received an honorary degree from his alma mater Cambridge University. 1996 Golden Quill: the Sir John Gielgud Award for Excellence in the Dramatic Arts, presented by the Shakespeare Guild at the Folger Library, Washington, D.C., 20 May 1996. 2007 Emmy Nomination: Outstanding Guest Actor in a Comedy Series, EXTRAS! 1993 GLAAD Media Award, "Stephen F. Kolzak Award"